Many people struggle with giving up sugar and staying healthy. 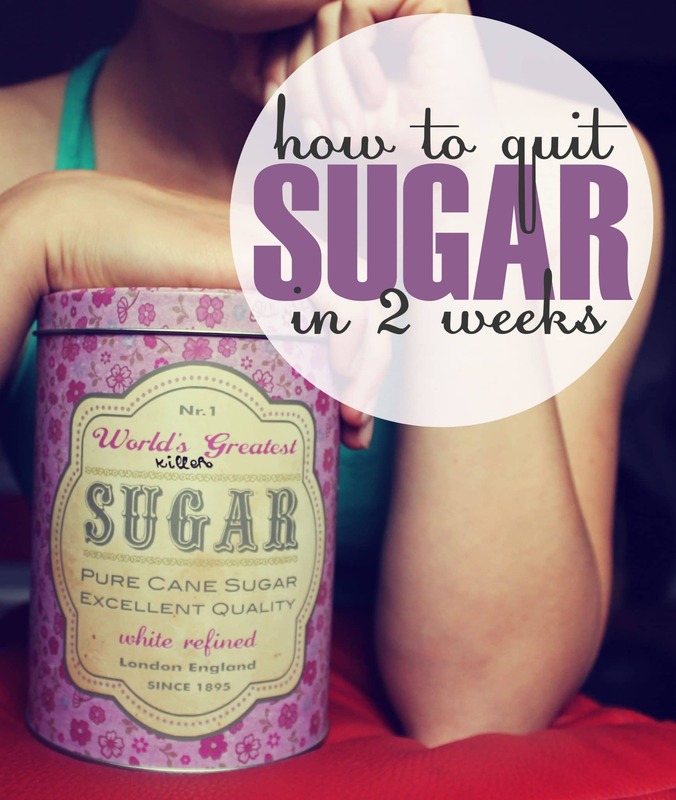 Today, I’m about to show you how I quit sugar in just 2 weeks. And I achieved that even though I was a real sugar junkie – I couldn’t imagine my life without donuts and chocolate. I went from 2 teaspoons of sugar in my coffee to zero, and from having at least one chocolate bar a day to not eating chocolate at all! Not to mention all the other products that contain hidden sugar – gone in just 2 weeks. I managed to quit sugar for good, in no time. And how have I done that? Well today, I’ll guide you through every single detail and show you step-by-step how I did it. I first came up with “The Team-Up Technique” a few years ago, when my boyfriend Matt and I decided to change our lives and start living healthier. After watching a documentary about sugar, we figured out how bad it actually is, and how it affects our organs, so we decided to leave it out from our every day menu. The internet was full of “sugar quitting” tips and programs, but none of them helped at the time. After a few months of struggling, we came up with an idea that could help us quit sugar once and for all. Because this sugar quitting method had to include both of us, we named it “The Team-Up Technique”. The best part is that you get to do it in a team! “The Team-Up Technique” has helped many people with their struggle of sugar cravings in the past few months. I found out about “The Team-Up Technique” a few months ago, after Monica convinced me to try it. When I decided to take a look at it, I realized that I wanted to at least give it a try. I never thought that I’d end up giving up sugar for life! 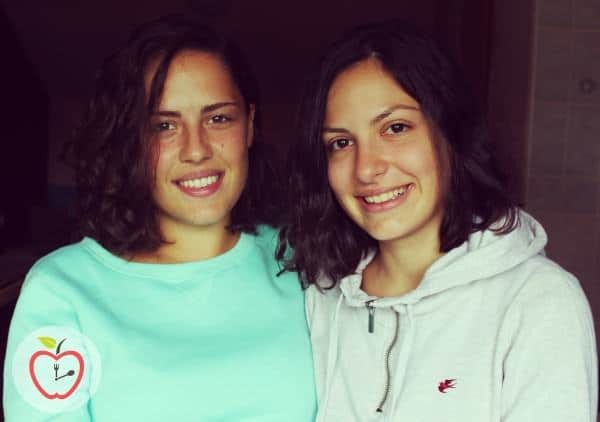 I convinced my sister to join me, and she said yes. Today we live happy and healthy lives without ANY sugar. Not only did we lose weight and start getting fit, but we started feeling better too. And these are just some of the countless benefits you’ll get by quitting sugar. You may be wondering why this technique works so well? What’s the best thing that can happen to any human being, while trying to succeed something? Having a support and finding someone that really believes in you and wants to help you achieve your goals – well that’s priceless. So through “The Team-Up Technique” I’ll help you get rid of your enemy, as long as you promise to be a team player. Getting to know your enemy is actually the first thing you want to do in order to get rid of it. And how else would you be able to realize why sugar is bad for you if you don’t know how it affects your body and health? So because of that, you’ll learn every single detail about sugar, here and now! Starting from why sugar is bad for you, to where it hides and what its secret weapons are, you’ll learn everything you need to know. Why is sugar called “white poison” or “modern worlds drug”? First of all, let’s get one thing straight – what does “sugar” even mean? The white stuff we all refer to as sugar is actually a sweet crystalline substance obtained from various plants, mostly sugar cane and sugar beet, consisting essentially of sucrose. Consuming this formula makes your pancreas secrete a hormone called insulin. One of insulins jobs is to cause your body store fat. It also affects a hormone in our brain called leptin. Leptin is a hormone that alerts your body to when you’re full. But sugar gives your brain a hard time recognizing leptin, so this means that you don’t really know when you’ve had enough to eat. You can’t stop eating before you finish your chocolate, right? Well, you’re not the one to blame – it’s fructose all the way. Fructose is actually that addictive part of sugar. I bet you wonder how it can be addictive. Dopamine is part of your brain’s reward system, it is what gets you addicted to certain things or behaviors. As you eat certain foods again and again, your dopamine levels start dropping down and the food becomes boring. But that’s not the case when it comes to sugar. When you consume sugar, your brain is rewarded, the satisfaction rises thus reinforcing the will to consume sugar again. Even though you’ve had chocolate many times, your brain will still be as excited as if you’re eating it for the first time in your life. That’s how the addiction starts. This is the main reason why obesity actually happens! The pancreas produces insulin that helps regulate the blood sugar levels – so the more sugar you have, the harder your pancreas has to work. And unhealthy pancreas leads to many diseases starting from Diabetes, to metabolic syndrome and heart disease. When ingested, the fructose is poorly absorbed from the gastrointestinal tract, and it is almost entirely cleared by the liver. Our liver can deal with the fructose, but the thing is, it can’t deal with the amount of fructose we consume nowadays. And the amount of sugar we consume is actually breathtaking. Sugar is used as a sweetener in food and drink, but the sad truth is that we can find sugar in almost every product these days. It is added in products that have never had sugar before and foods you wouldn’t expect. The sad statistics say that 80% of the food items in America contain added sugar. The food manufacturers use many different names nowadays, so it really gets trickier to avoid it. And why does the food industry wants to hide this white toxin so hard from us? Because it is not good for us, but it makes every food taste better, and tasty food sells! It has also been proven to be as addictive as cocaine and heroin! Well, that really makes the point because if we are addicted to their products, we’ll keep buying them, and they’ll keep making money, right? The simple answer is that we have dramatically increased the sugar intake, because it is everywhere around us. 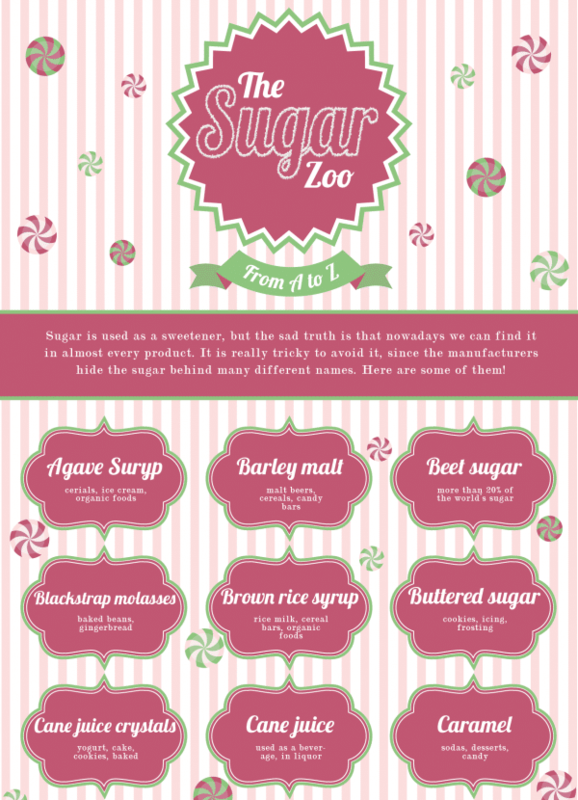 Click on the image to learn about the other 30 names of sugar. 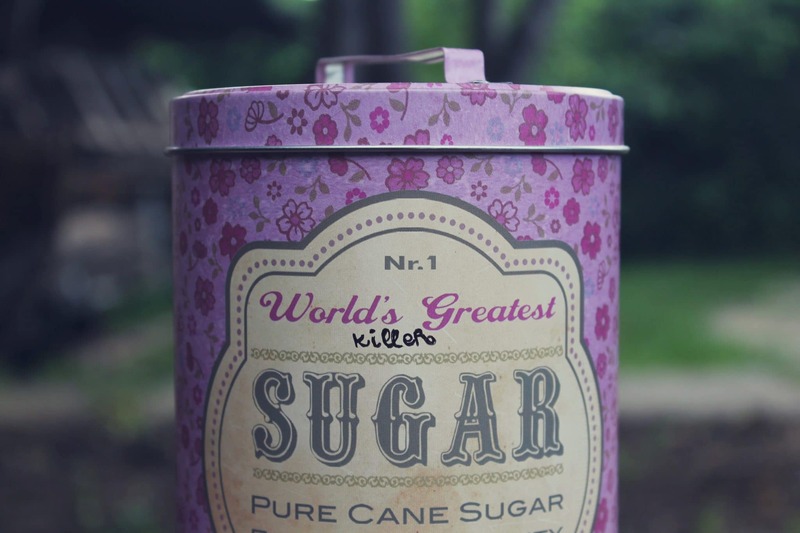 So yes, sugar is a sweet killer. After watching a series of documentaries about it, I’ve had enough! I strongly recommend you to watch some of these documentary videos. just to make sure that you’re ready to head on to the next step! 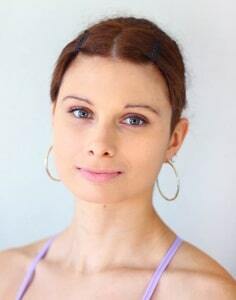 This part is really important, and it makes this technique unique and successful. You can only succeed if you have the right partner. And by the right partner, I mean a person that you will walk this path with. You’re giving up sugar, but every single person around you is eating ice creams and donuts, in your face! Well it would be easier if you had at least one person that you’ll give and get support from, right? And that’s what I’m offering to you. Choosing the right teammate is something that you should do really carefully. Don’t underestimate this, because this step is a REALLY IMPORTANT one. It’s one of the main reasons why “The Team-Up Technique” works so well. Get back to the first step, and teach him/or her why sugar is bad. You have to convince this person to quit sugar, the same way I convinced you to even consider reading this in the first place! Watch the videos together, re-read everything again, help them admit the addiction, and finally start this journey together. You’re the teacher now and it’s all up to you. After they says yes, you’re set. Why does it takes two? People are proven to work better and achieve more results when they work in a team. It’s not about competition, it’s about working together to achieve the same goal. Not that you can’t do it by yourself, but it’s 10 times easier when you get to do it in a team. You’ll help each other and you’ll have each other when bad times come. And in the first sugar-free week there will be some bad times. If you decide to have a bar of chocolate – go for it, just not before you tell your teammate. Always remember that you started this journey together, and you will come out of it even more bonded than before. Remember – support is the key to success! Add the right foods to your diet. There is an endless list of foods that contain a lot of added sugars. As I said, 80% of the food products in America have added sugar in them. See, these are just few of the products with hidden sugars in them. And the sad truth is there are tons of them! Read every product’s ingredients before buying it. This is one great habit if you want to maintain a healthy diet – it can take more of your time when shopping, but it’s worth it. And remember – “low fat” or “all natural” doesn’t always mean zero sugar. I gave you the hidden names for sugar, so make sure you spot them right away next time. Also: pasta, noodles, crumpet, rice cakes, couscous, bulgur, popcorn, flour. These are all carbohydrate rich foods and you want to leave them out of the picture. After one month, you can start consuming whole grains now and then, just stay focused on choosing the healthiest options you can! Not only foods that will keep you away from this sweet drug, but foods that will balance out your blood sugar and insulin levels. When it comes to the food you should eat, there are 3 kinds of nutrients that you have to include in your every day meal plan. These three are the best combination of nutritious rich food that is good for your body and well being. Proteins have to be included in every meal of yours. Getting more protein to your diet, helps you balance your blood sugar and reduce the sugar cravings. – be aware of marinated meats (they are usually very high in sugar). – fish is one of the highest protein foods that are VERY healthy for your heart. – lactose products such as milk can be tricky, but I still kept them in my sugar free formula. – beans are high in protein. – you can choose from green beans and chickpeas to soybeans and still make no mistake. Healthy fats are the next group you have to include in your sugar free diet. Unlike the saturated fats and the trans fats, these healthy dietary fats are a great way to improve your health and balance out the insulin level. * peanuts should be avoided, because of their bad fatty acid profile. Fibers are last but definitely not least! For breakfast you can make a smoothie, for example: coconut milk, chia seeds, berries and whey protein; or if you like it better you can have eggs (boiled), vegetables and a glass of yogurt. For lunch, you can have chicken breasts with green beans and avocado; or maybe a salmon and a salad with olive oil. For dinner you can make a Caesar salad (just without the bacon part) with low fat sour cream mustard curry dressing. 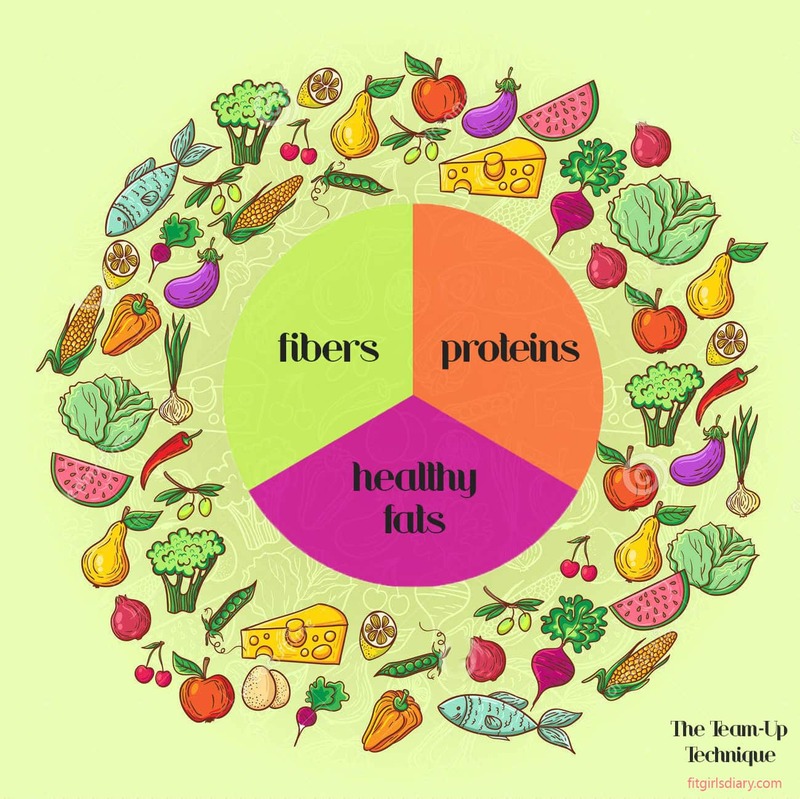 You just have to make sure they contain the perfect combination of proteins + healthy fats + fibers. The fruit question is really confusing to many people that try to quit sugar. We’re taught that fruit is healthy, and people can’t understand that fruit is actually just another form of sugar. It’s all natural, but it’s still fructose, right? And fructose is the part that makes you addicted to sugar in the first place. Choose fruits that are more watery. I eat fruits occasionally and I avoid fruits that contain large amount of calories – more calories = more sugar. If you drink your coffee and tea with a lot of sugar, how are you supposed to drink it clean, right? I don’t suggest you to take substitutes such as raw honey or coconut sugar. Even though they are natural, they are still sugar but plant-based substitutes, natural and healthy sweeteners for diabetics such as stevia are okay. As you quit sugar, you’ll get the addiction out of the picture and it would be easier for you to imagine even your tea or coffee without any sugar. Till then, stevia is a great choice. In the sugar recovery process there are several supplements that can actually help you along the way. – These are not pills, these are nutrition supplements that can help you get over the sugar cravings faster. First of all, probiotics are actually live bacteria. As you all probably know, our bodies are full of bacteria, especially in the guts. Some of these bacteria are bad and some of them are good, but they HAVE TO be balanced at all times (around 80% good – 20% bad). Probiotics are one of the good bacteria and their function is to make sure to keep our gut healthy. They are both good for your health and for your digestive system. But why do we actually need them as a supplement to get rid of sugar? Well, it’s simple – they lower the amount of yeast and bad bacteria in our system which feeds off sugar, and brings back the balance. The more sugar you eat, the more these bad bacteria grow. The probiotics will help you fight these bacteria and replace the loss of the good bacteria, while fighting the sugar cravings and keeping that yeast balance in the body. So taking just one probiotic a day with your meal will help you stay away from sugar for sure. Another supplement that helps us reduce the sugar cravings is B complex vitamin. One of the main reasons we crave sugar so badly is stress. B complex vitamin helps us reduce the stress when having more frequent sugar cravings. You can take them whenever you are stressed and discomforted. As we’ve already learned, one of the best ways to help you with the sugar quitting process is consuming lots of protein. Whey is a great source of protein, so you should consider having it as a supplement while doing “The Team-Up Technique”. Just be really careful with this one, because there are many whey proteins that actually have sugar added. Make sure to read the ingredients before buying any product. You can add whey to your morning smoothies, or drink a shake or two right before bed. *For more helpful tips about the needed nutrients when giving up sugar, you can visit Dr. Axe website. And the final step in my “Team-Up Technique” is to start doing the right types of exercise. Wait, what?! Is there a wrong activity when trying to quit sugar? If you’re doing a lot cardiovascular exercises, you’ll crave more sugar. Apparently, when doing long cardio activities, such as running or triathlons, your body craves for carbohydrates. This means that these types of exercises are not helping your sugar quitting efforts. These types of exercises will help you balance your blood sugar levels, and will be a big help to the whole sugar quitting process. Not to mention that they will give you a great body, especially my personal favorite weight lifting training. 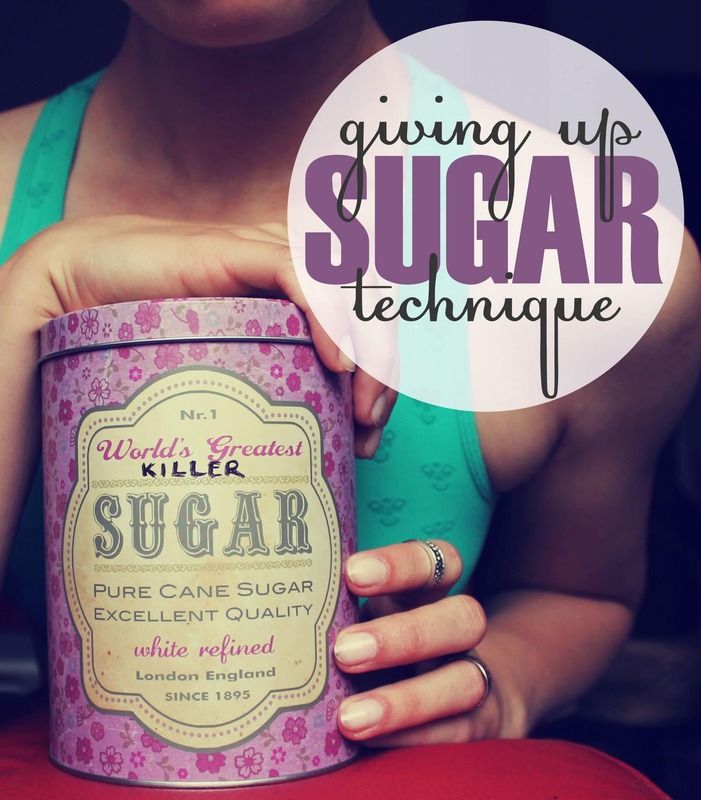 Now It’s Your Turn To Try Giving Up Sugar! I hope you can see how “The Team-Up Technique” can help you quit sugar in just 2 weeks and change your life forever. Unlike other methods, you won’t have to do it all by yourself, everything is easier when you’re part of a team. Yes, it takes patience and a lot of giving up to change yourself, but once you set your mind that you can do it, you’re half way there. Just believe in yourself – YOU CAN DO ANYTHING! Share this technique with your friends, so they can start quitting sugar and live a sugar-free life. So milk is okay…… that’s clear! Well, I don’t say that milk does not contain sugar. Lactose is a type of sugar as well, but in my opinion (and many science approved studies), this type of sugar is not that harmful. The sugar found in milk products is 100% natural sugar, as it comes from the cow. Even people with type 2 diabetes are allowed to consume this kind of products, because of the fact that lactose cannot be the reason for them getting diabetes in the first place. This really helped me a loooooooot! But I kinda wanna lose weight faster, should I count like, 10 grams or less, per 100 grams? And milk is like 4,5 grams per 100. So it’s all cool Eileen. You have mistakenly listed Whey as a food with hidden sugar. So check twice before buying one. Whey protein is okay, I’m just saying to go for a pure clean whey protein, that does not contain any bad sugar sweeteners. Many protein powders contain added sugars, because obviously sugar makes the protein taste better, which may decrease or reverse some of the beneficial effects of high protein intake on weight loss and health. Quinoa is not a grain. Its a seed. The thing is, we cook and eat quinoa like the other grains, but, botanically speaking, it’s a relative of spinach, beets and chard. It’s actually a grain crop grown primarily for its edible seeds. However, I like to refer to quinoa as a grain, since it has almost 40 grams of carbs, which is similar to the grains. It’s gluten free, but it’s still a strong carbohydrate. Hey, you can accomplish your goals by following a nice workout program, and a healthy eating plan. Have you checked out my Breaking at workout program?